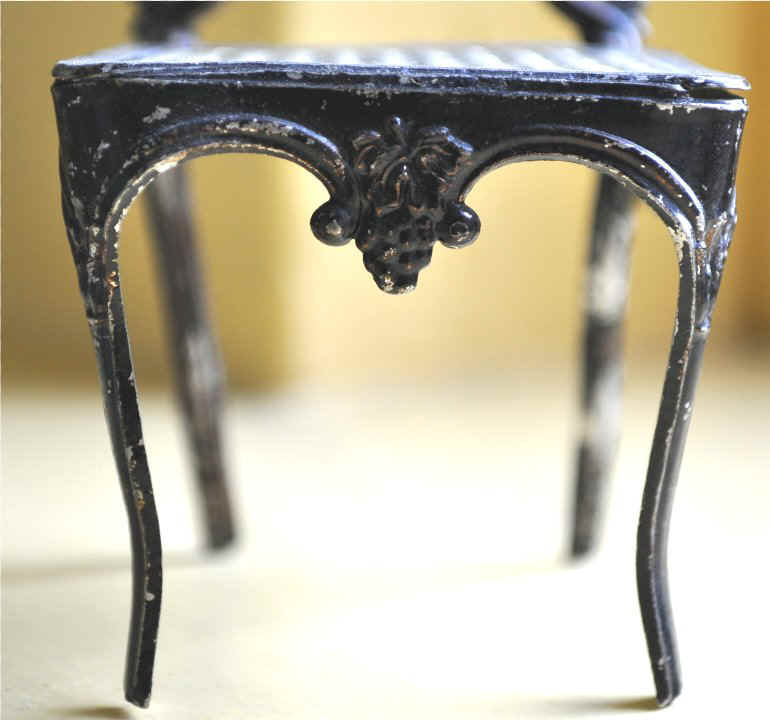 As the 19th century progressed, delicate cabriole legs gained favour over turned legs but were difficult to manufacture in miniature unless cast in metal. 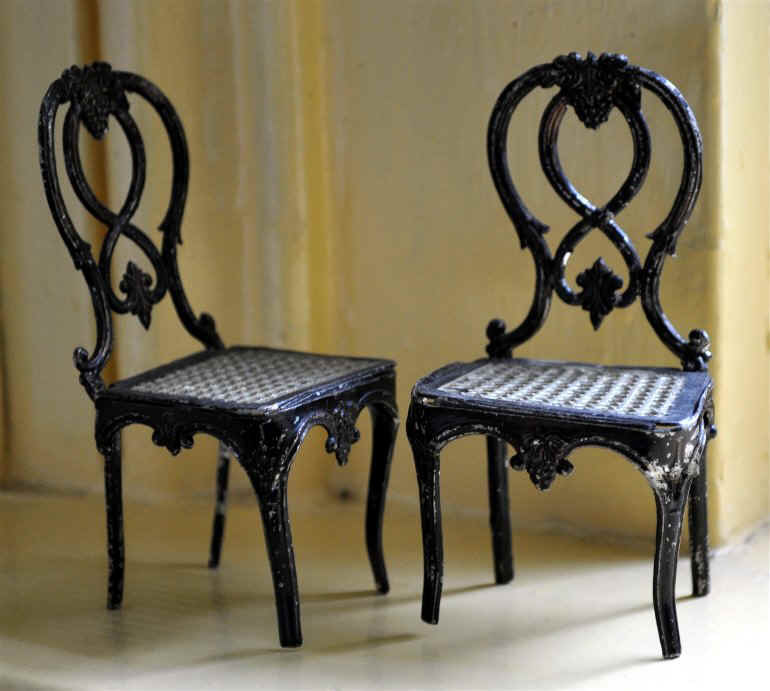 Backs became more elaborate, again difficult in miniature unless in metal. 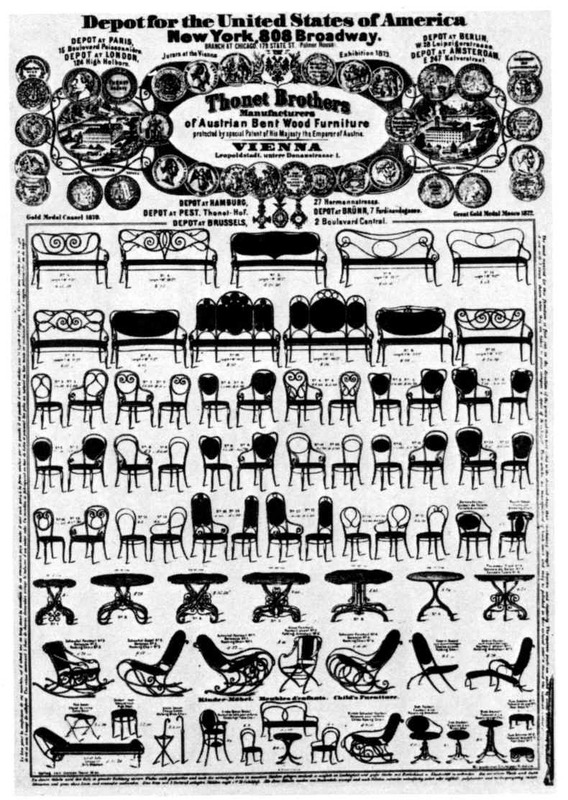 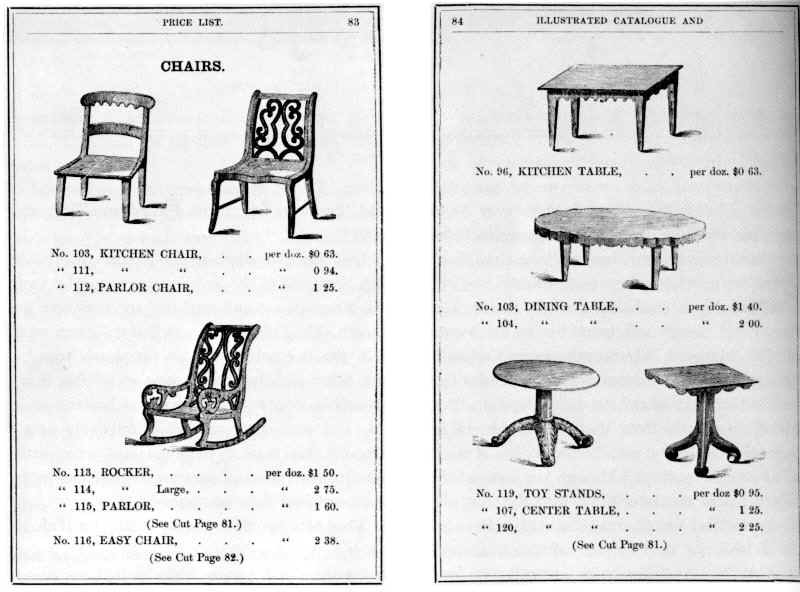 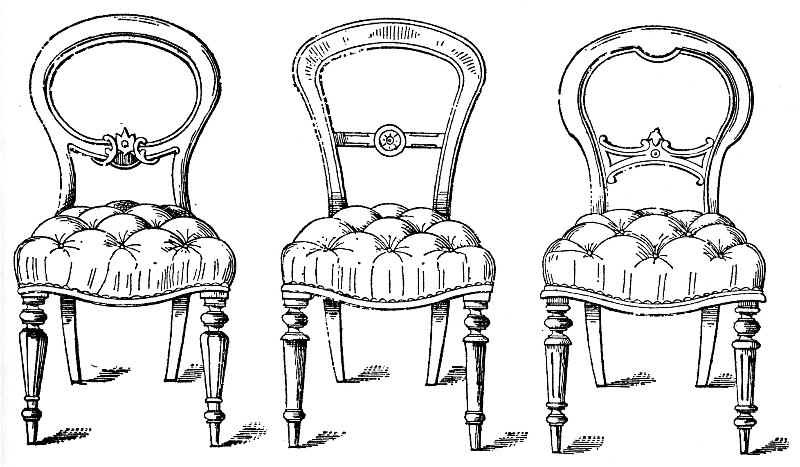 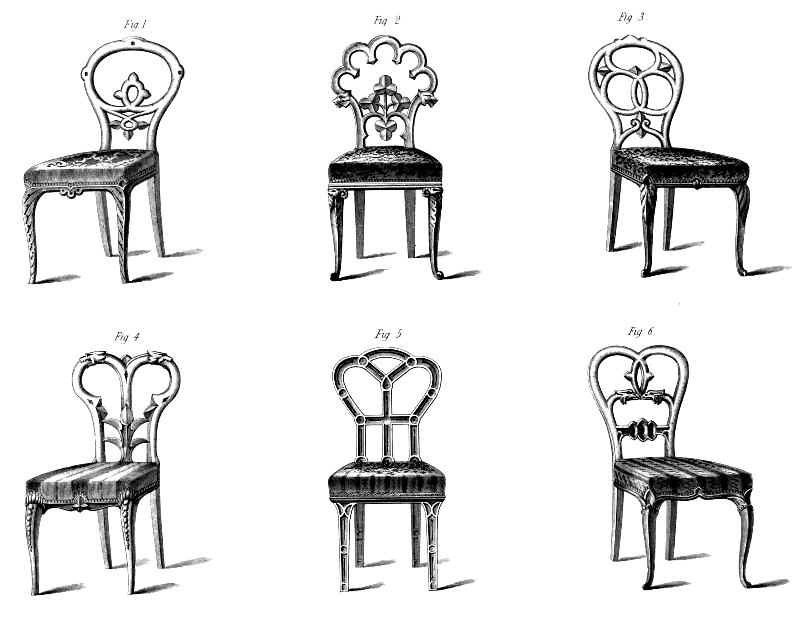 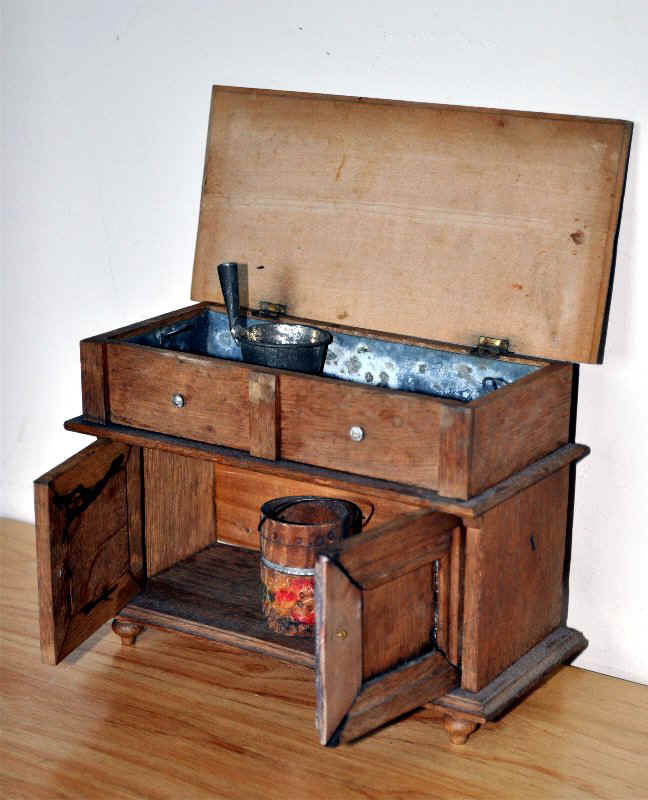 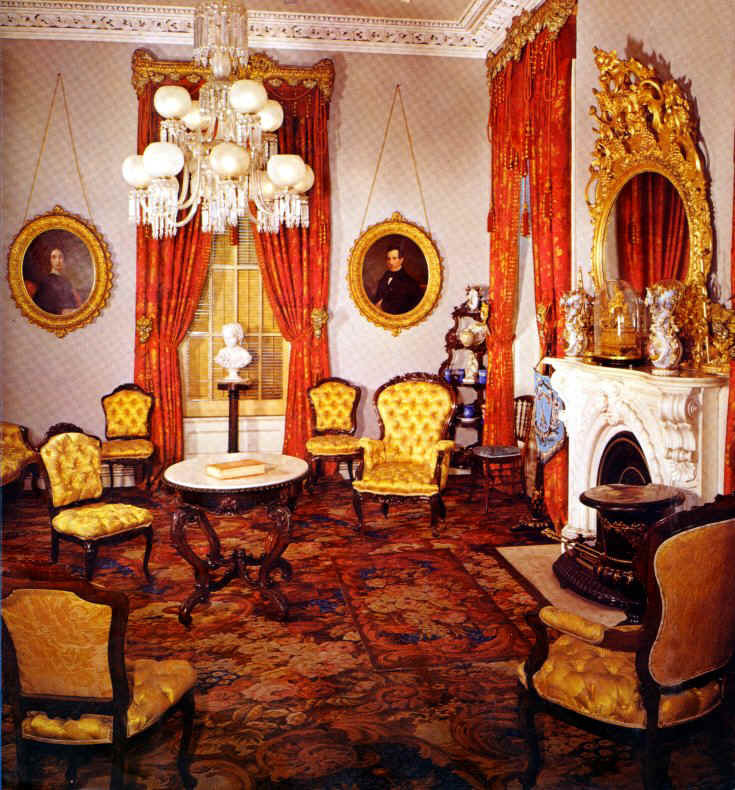 American cast-iron dollhouse furniture in the 1872 Stevens & Brown catalogue of Cromwell, Conn.; Rococo Revival forms; wood fretwork has been imitated in iron. 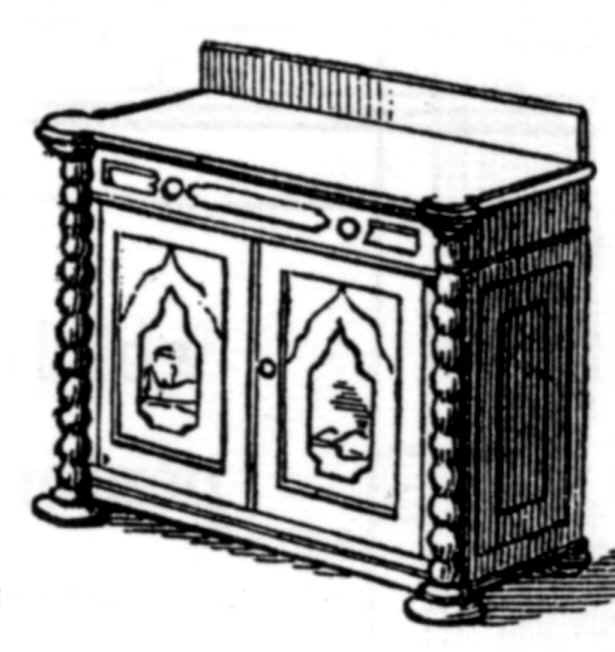 Available in a various scales. 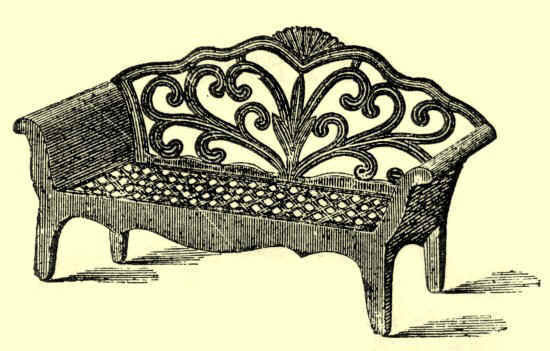 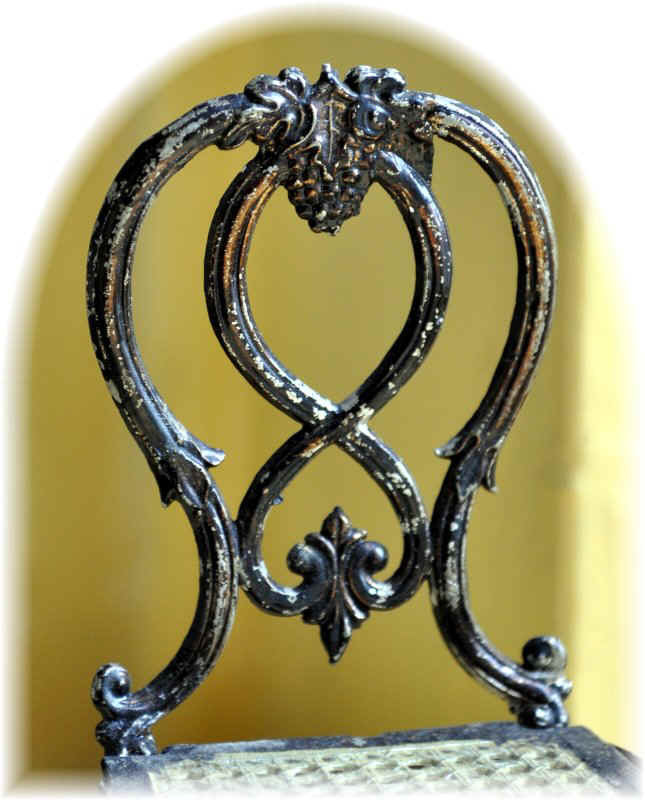 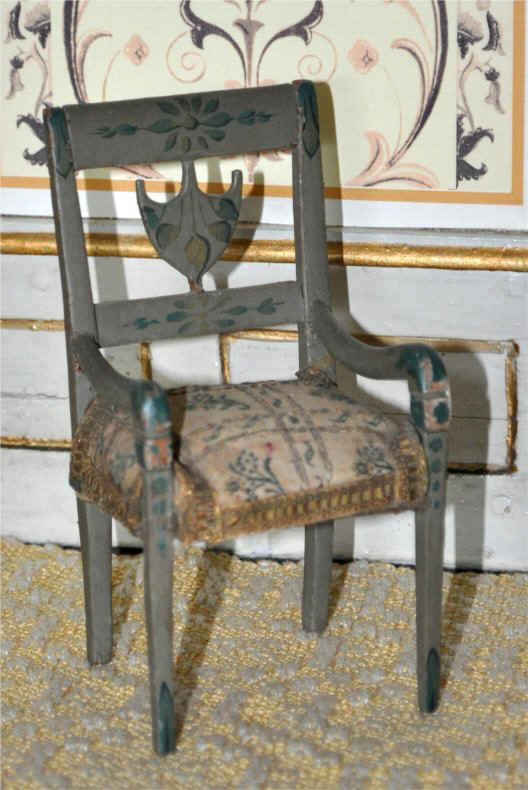 Example of Rococo Revival fretwork incorporated into a real French étagère illustrated in A.J. 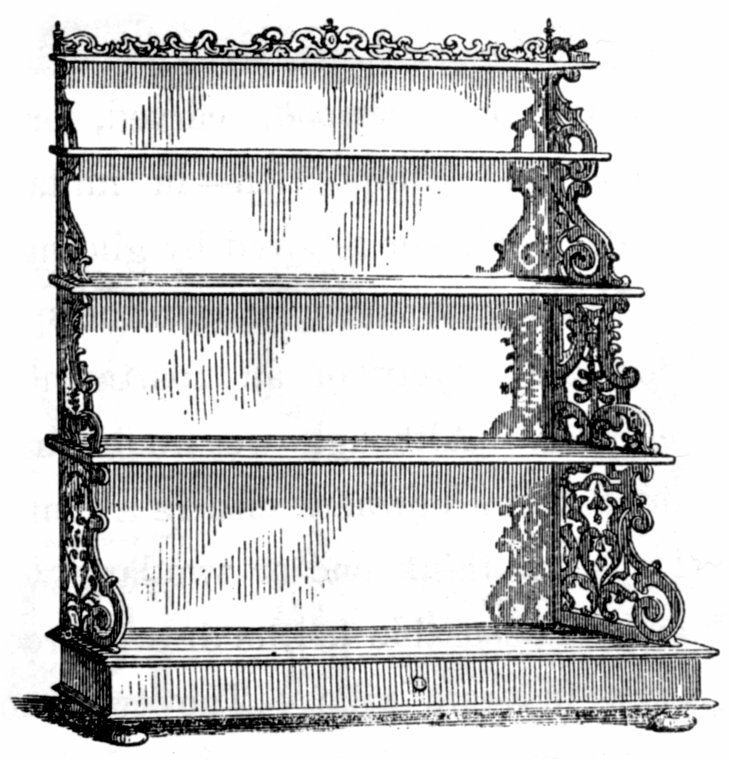 Downing's American book, The Architecture of Country Houses, in 1850. 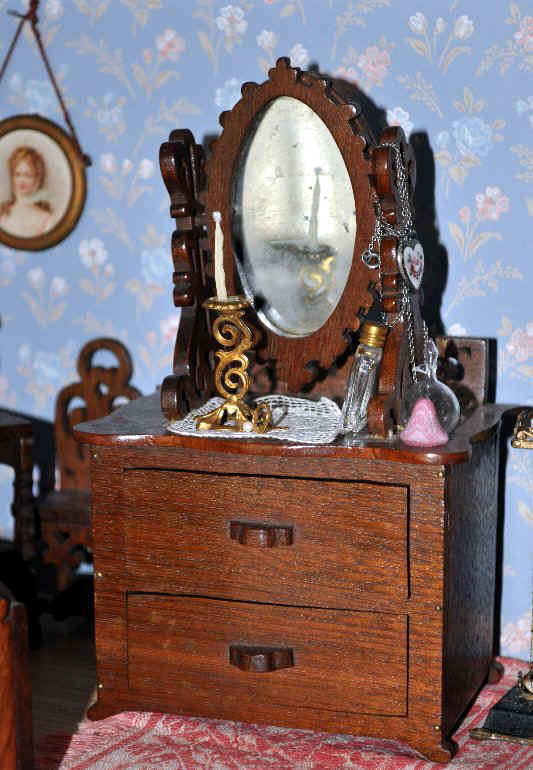 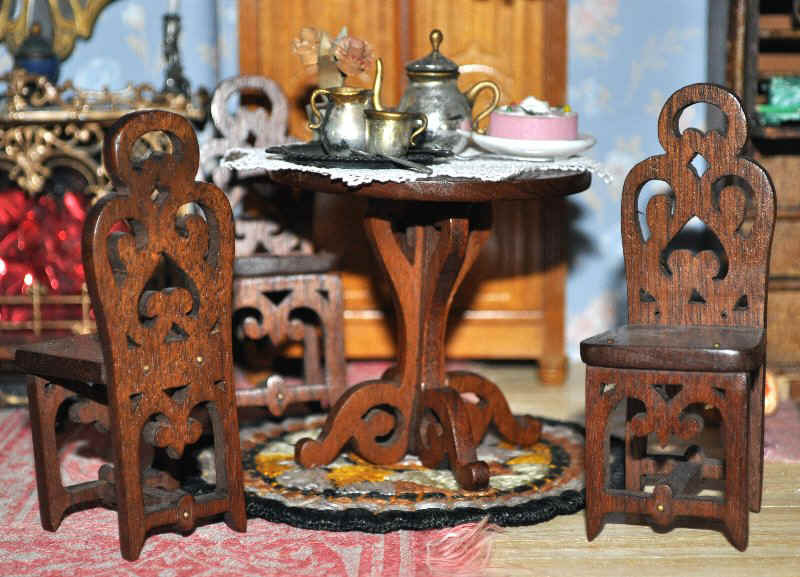 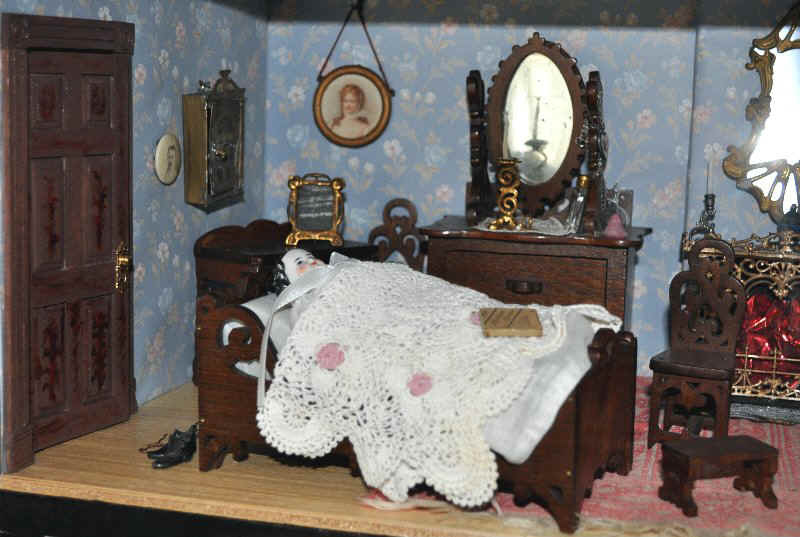 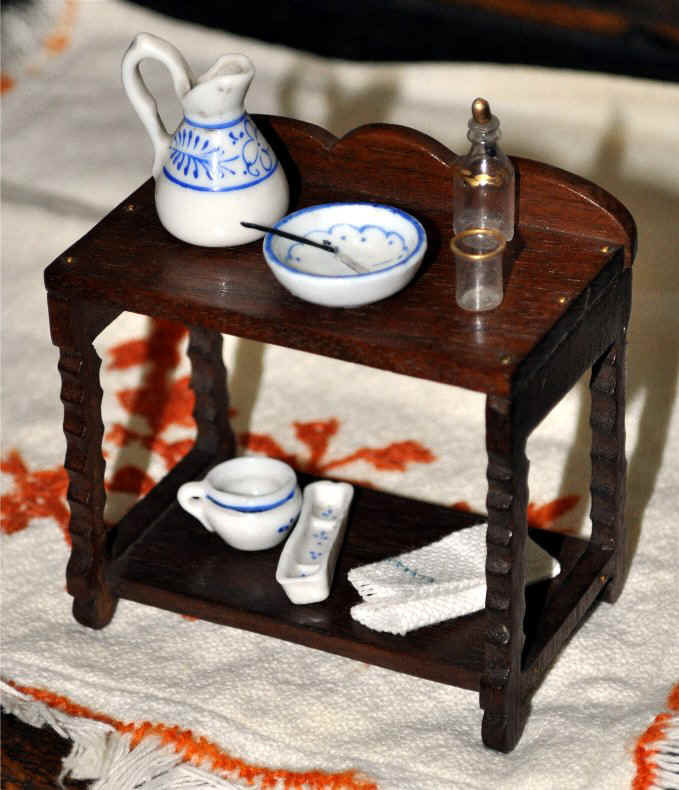 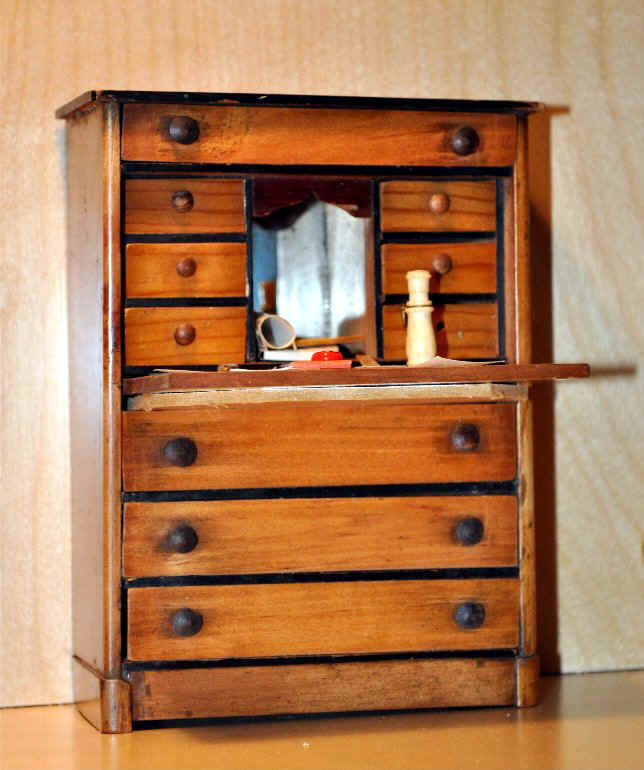 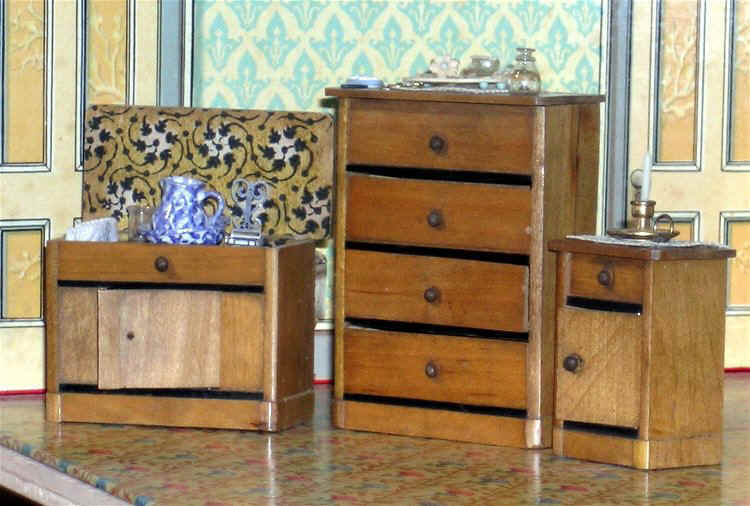 Set of dollhouse furniture (bed, 3 chairs, tea-table, footstool, chest of drawers with mirror, and washstand) made in the 1870s in the USA; documented as a gift in 1890 but made for the donor, Mrs Hall Curtis of Massachusetts, when she was a child. 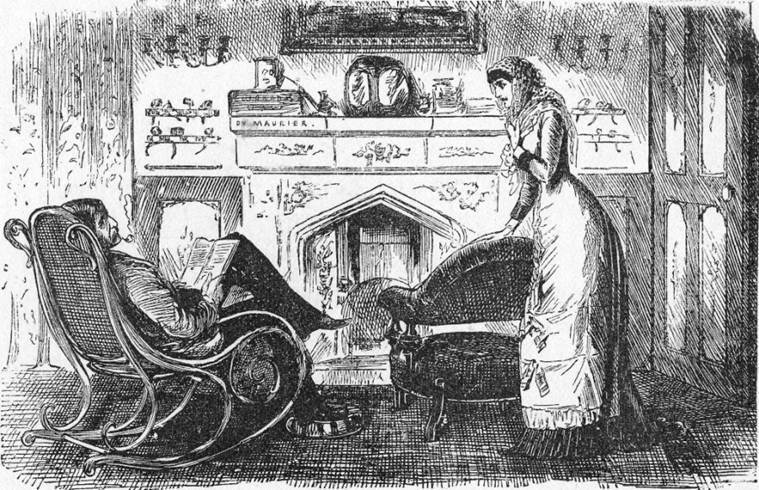 She was an Endicott of Salem, Mass. 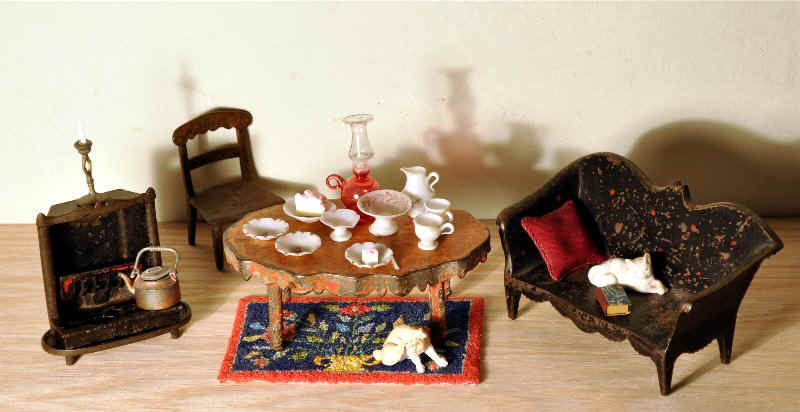 Another set was made for her sister. 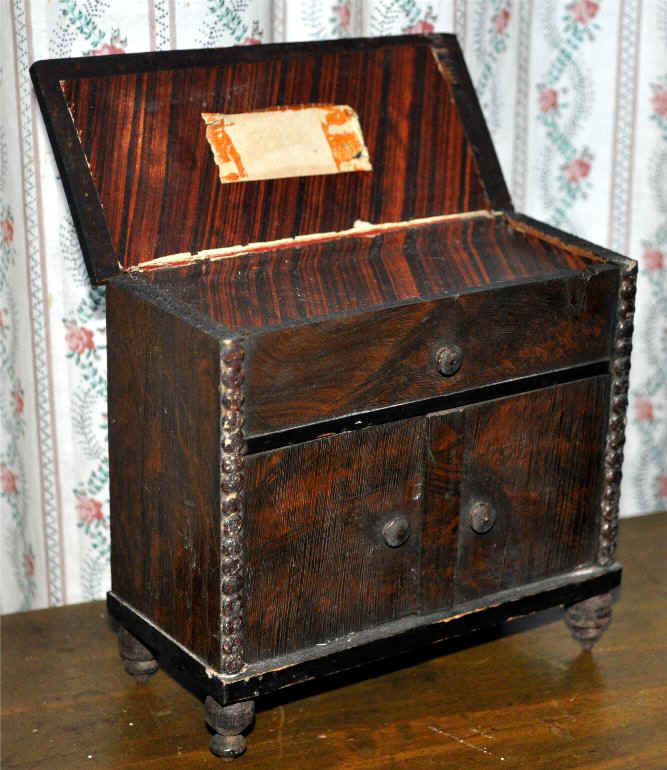 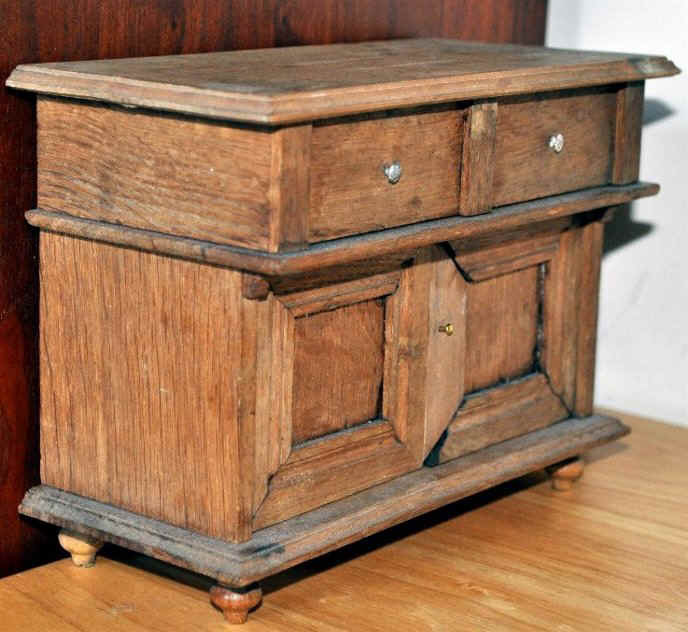 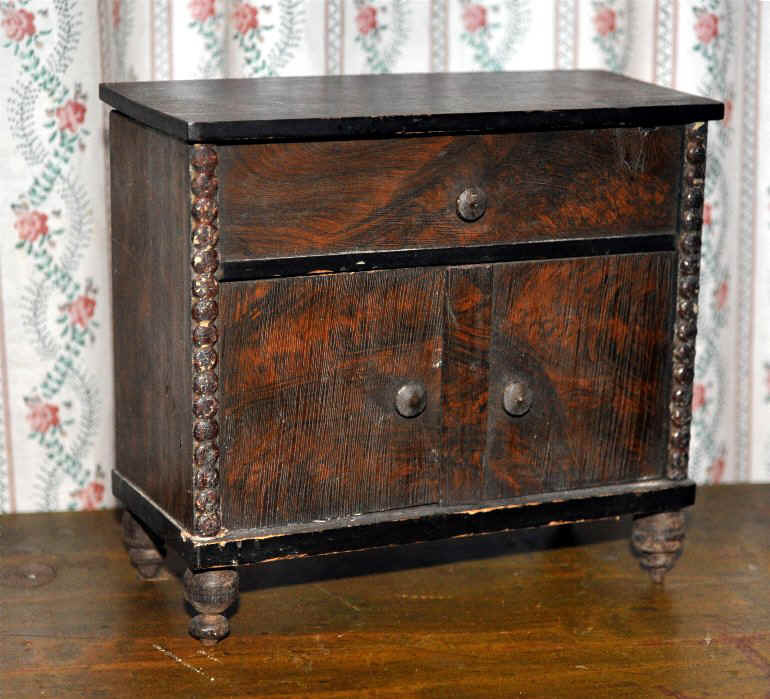 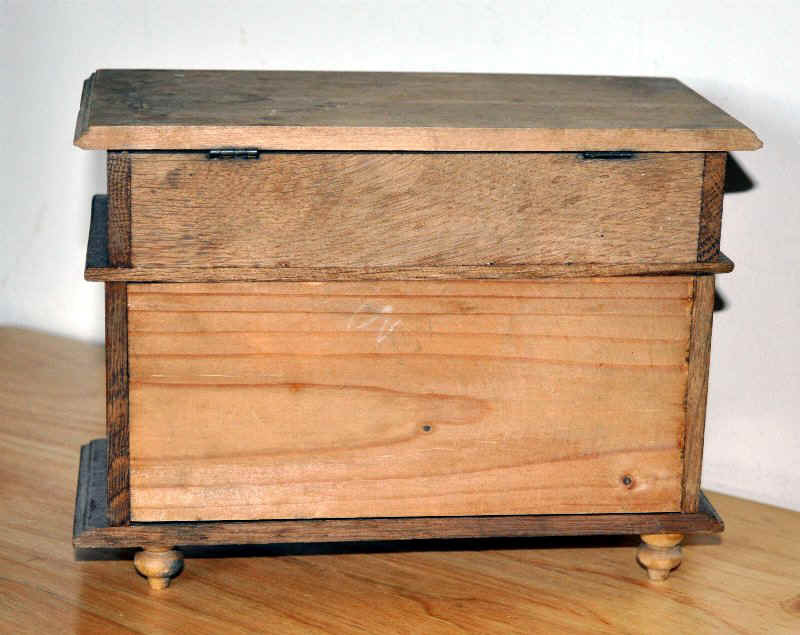 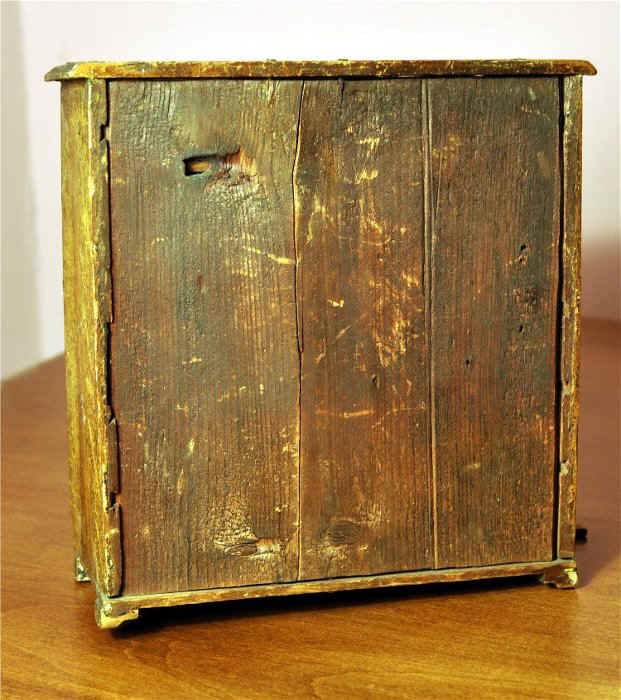 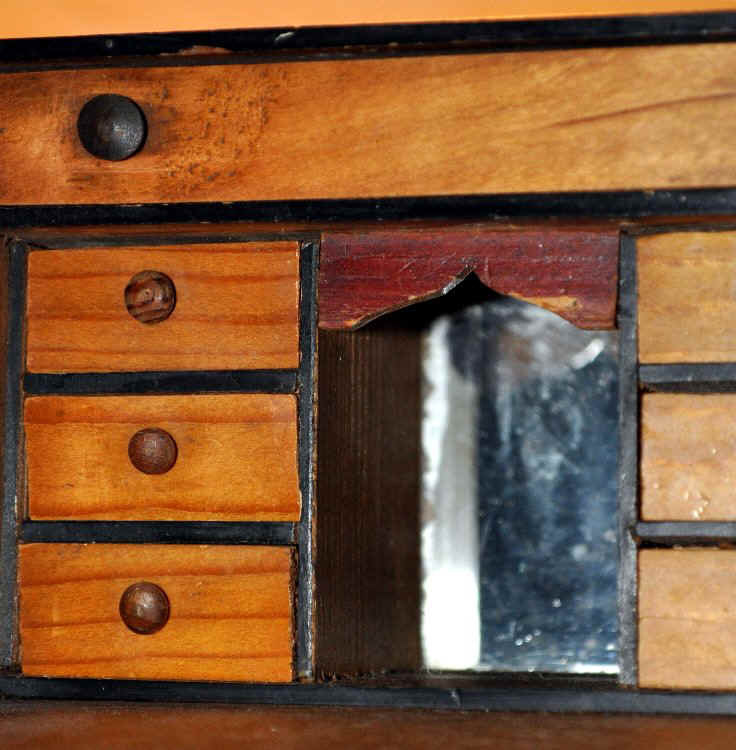 Solid dark wood nailed together with decorative brass-headed nails. 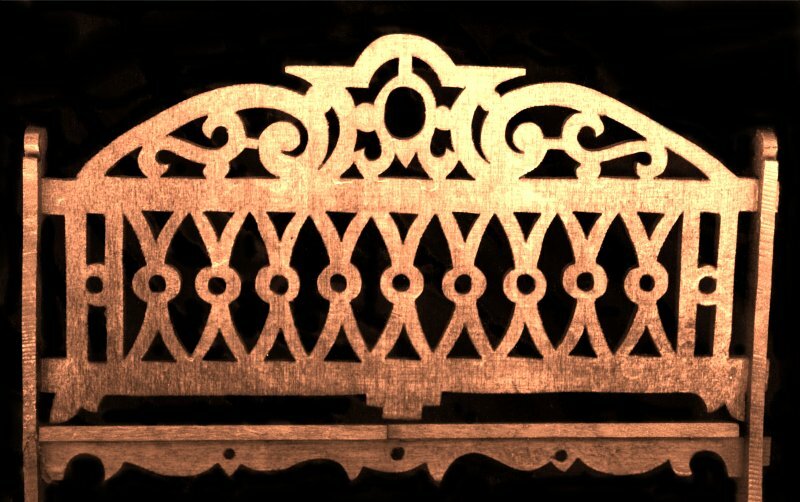 Fretwork in the Rococo Revival style. 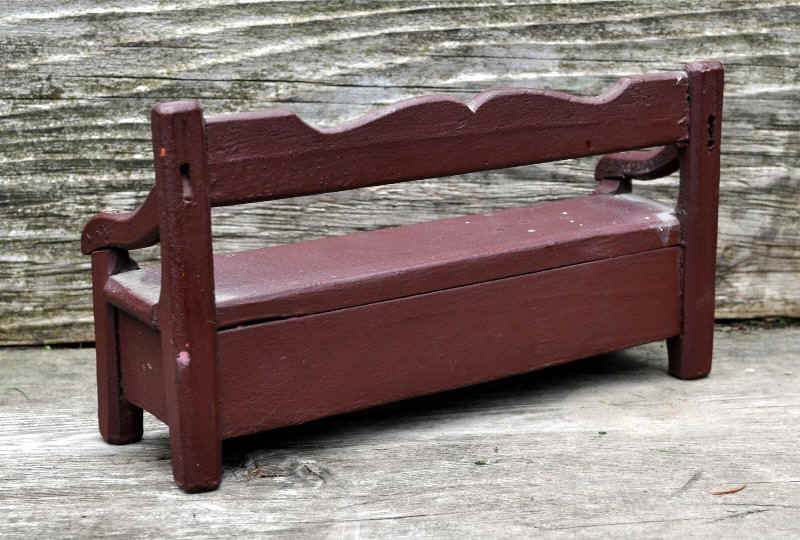 Bed just over 6 inches long. 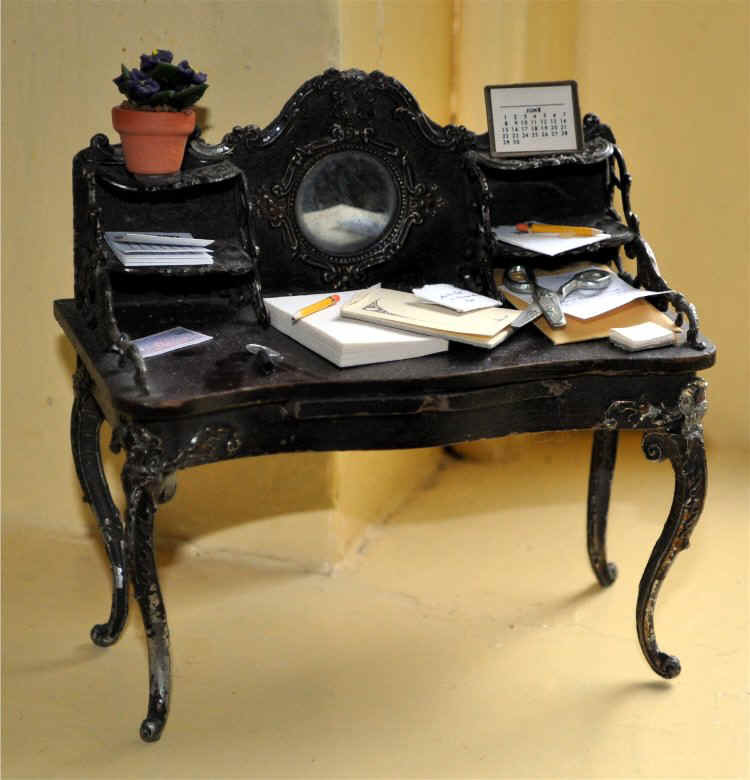 Although this desk has been mistreated, it is very appealing, especially when not "under the spotlight' of the camera. 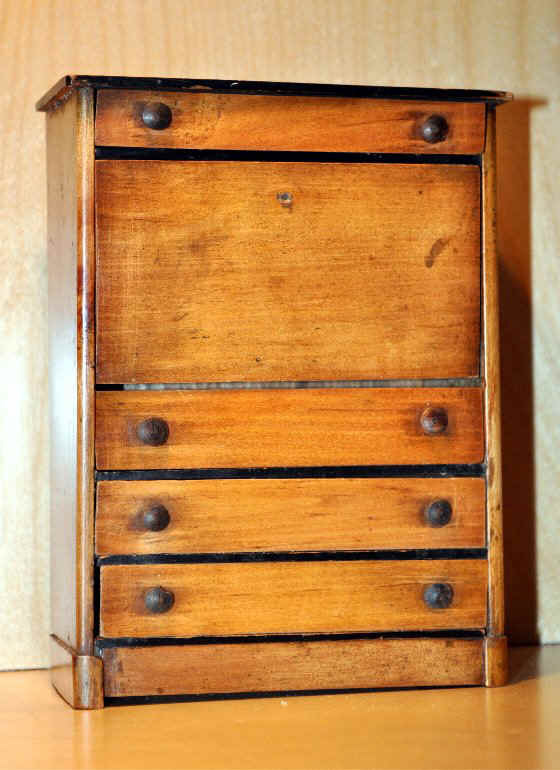 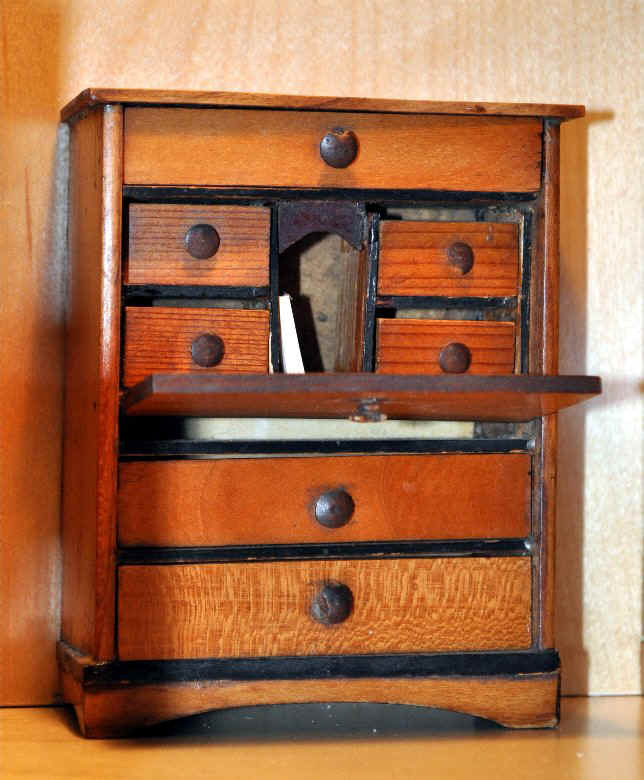 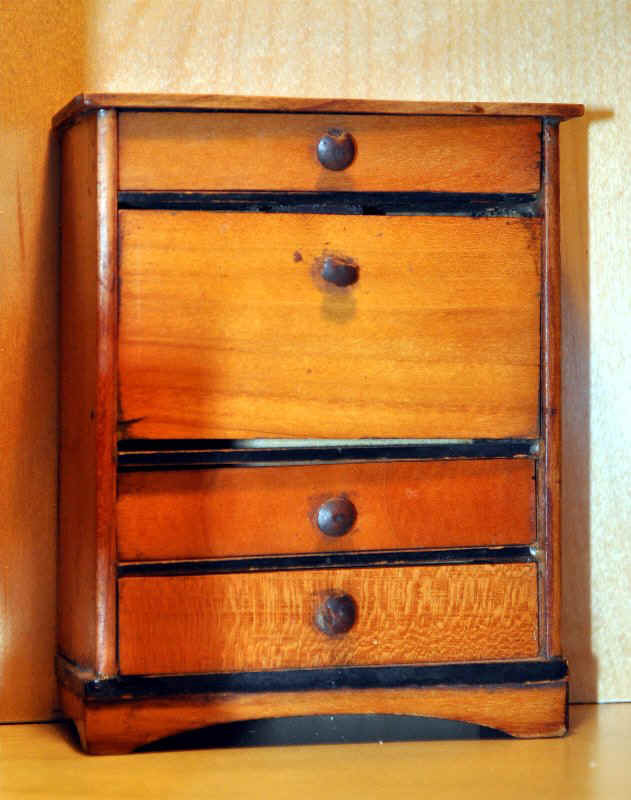 In one of the drawers is a newspaper clipping dated 1877 and written in German. 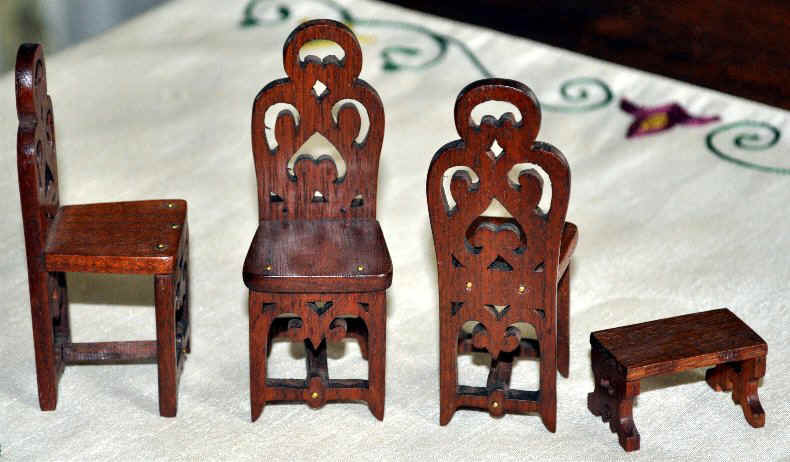 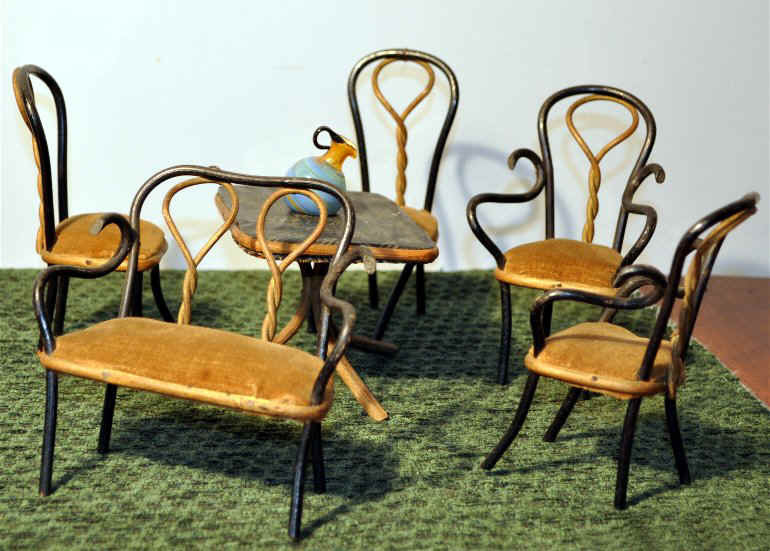 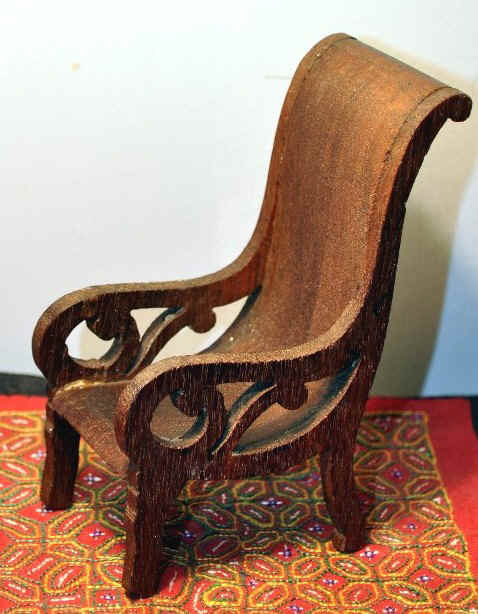 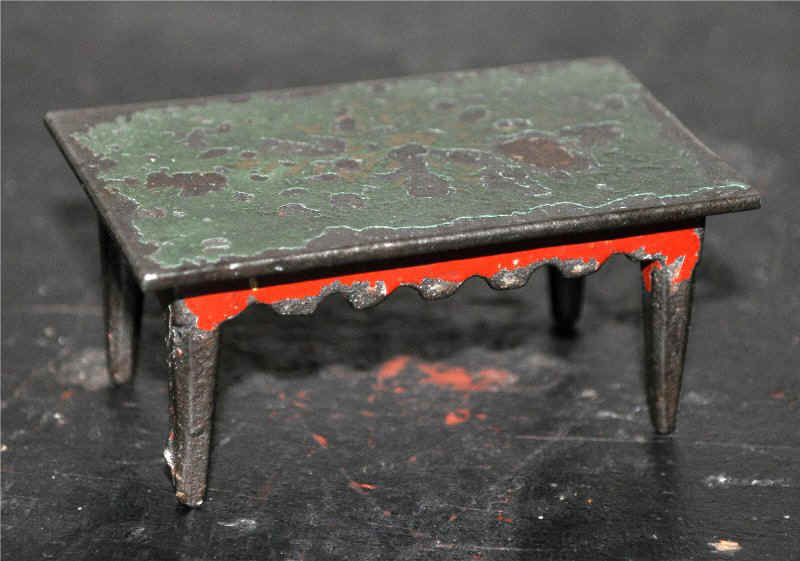 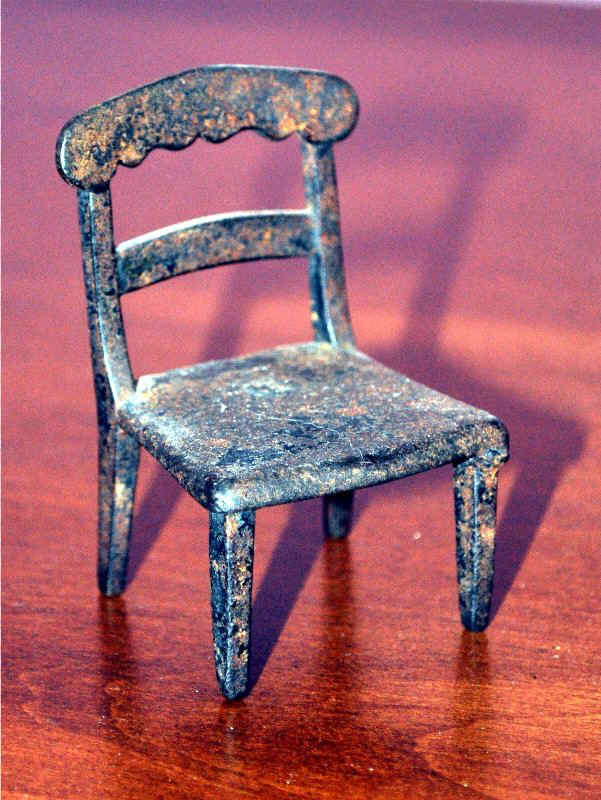 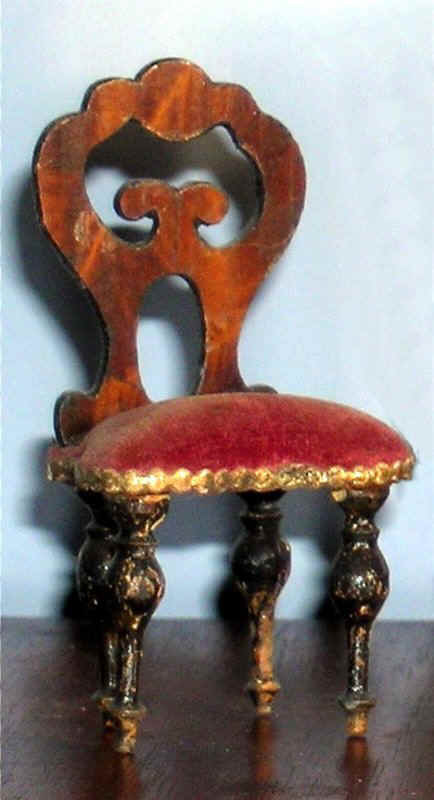 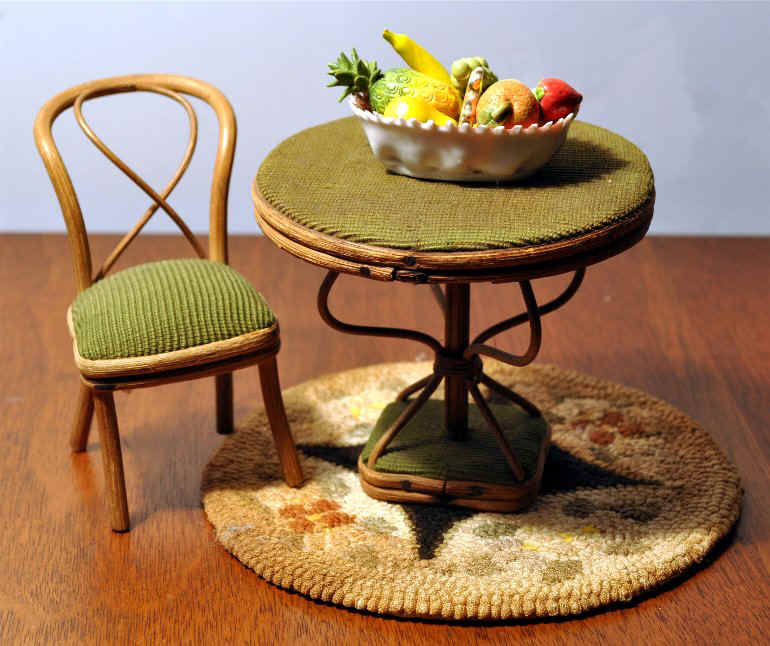 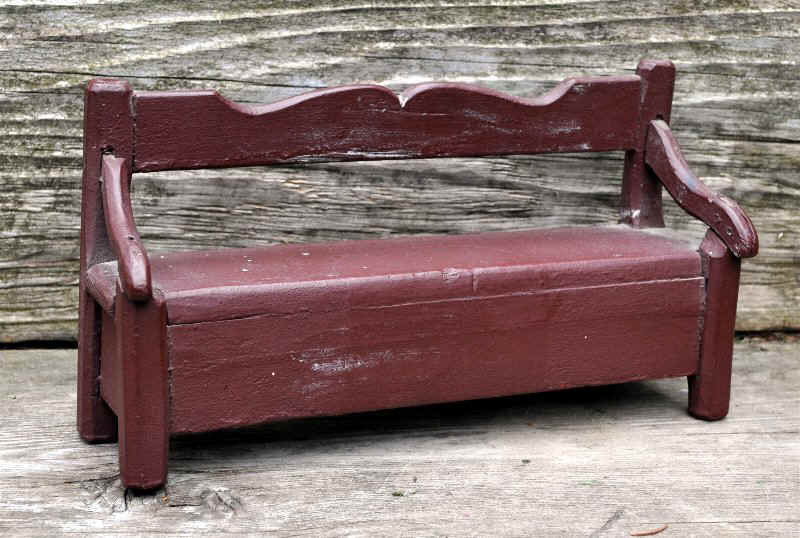 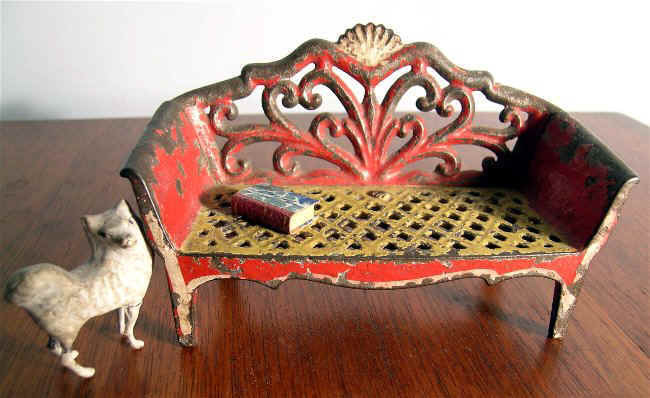 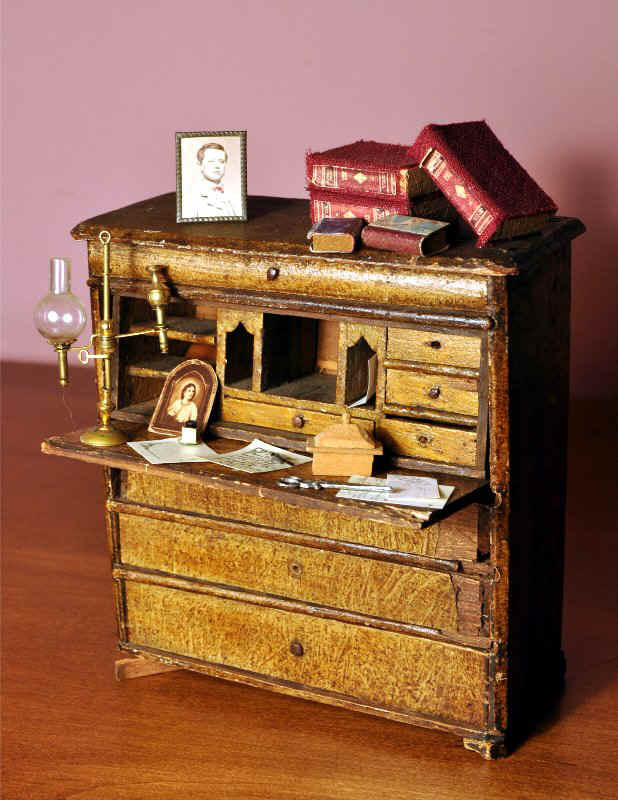 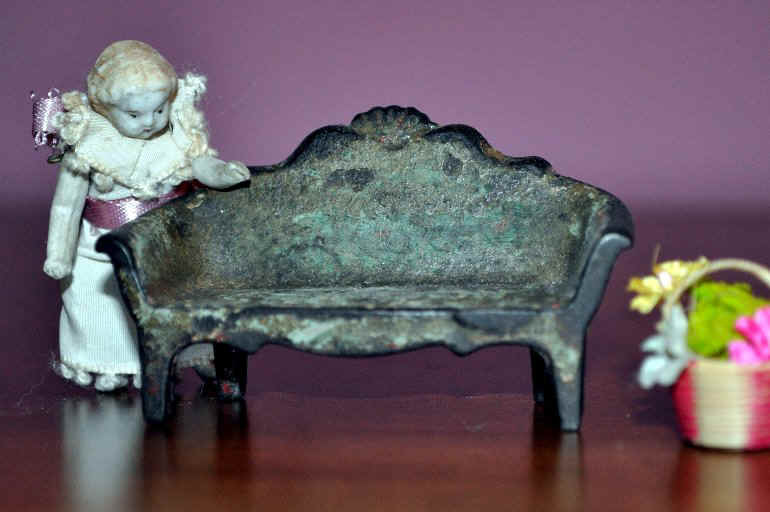 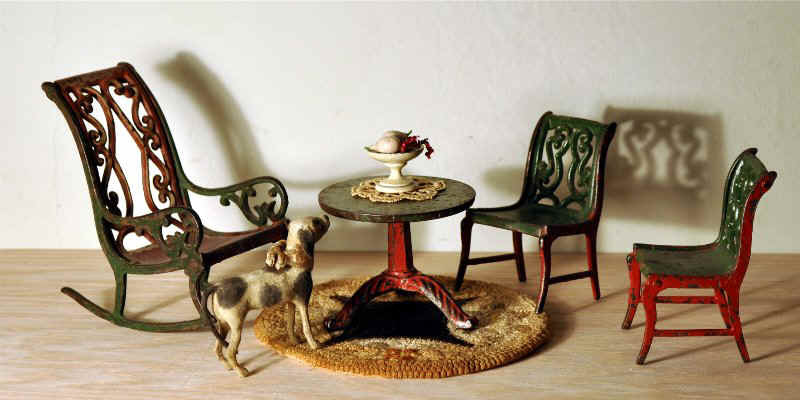 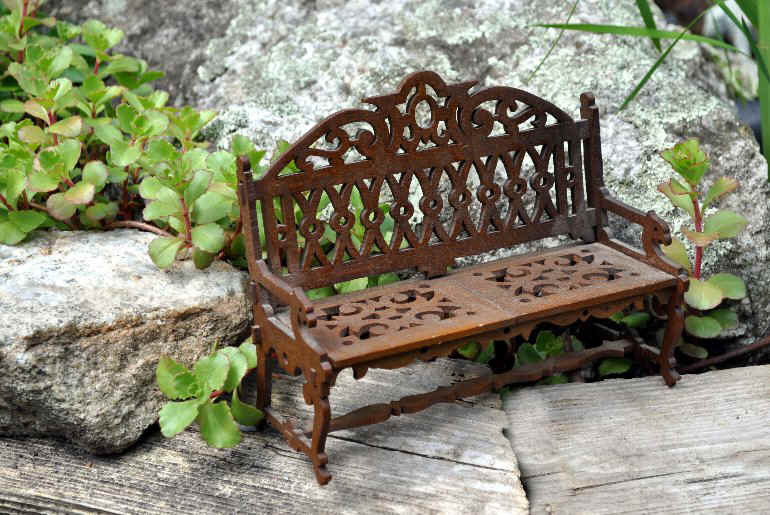 Miniature furniture, settee 4½ inches long, in the Thonet manner, c1870s-'90s (reference books usually date these sets as late as 1900, perhaps identifying them with Art Nouveau style, but they predate that style by decades; on the other hand, they continued to be made for decades). 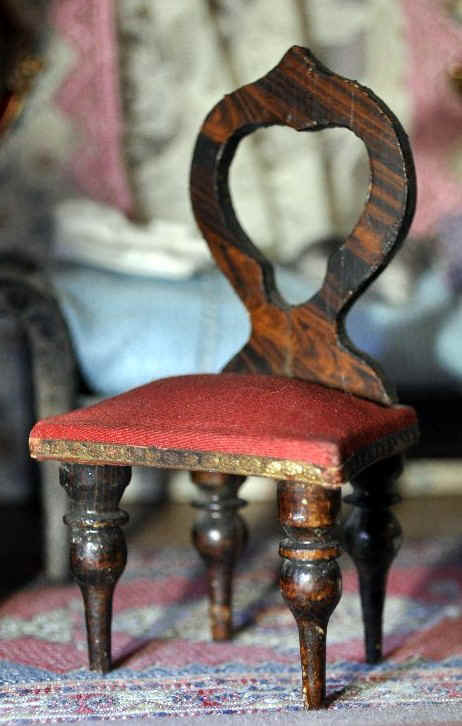 Hooded cradles are difficult to date as they are a very old form but remained popular across the decades, for example being made as late as the 1930s by the American firm Tynietoy (as a revival of a colonial idea). 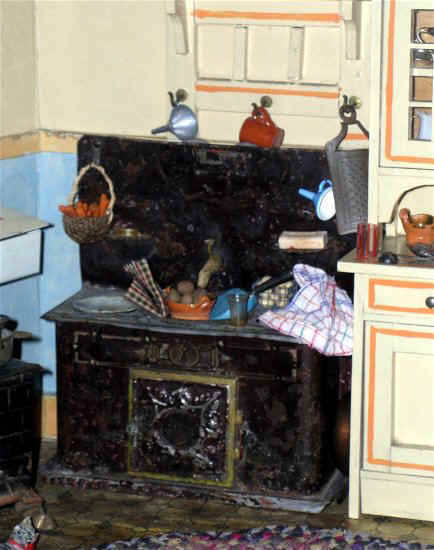 The hood protected the baby's head from draughts, which were particularly present when fireplaces were in use. 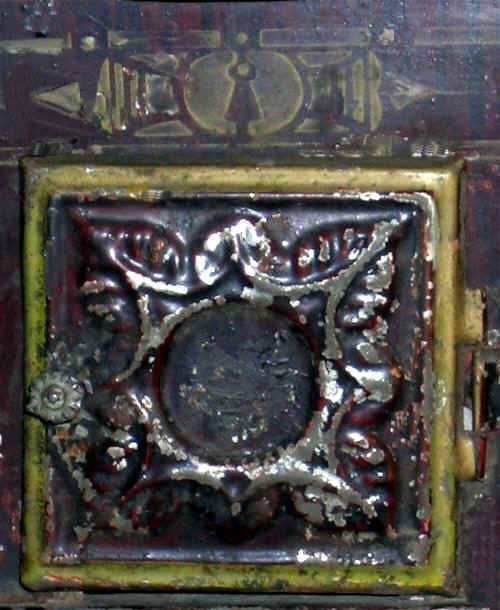 The example on the left, an early souvenir of Newton Stewart, a Scottish town, has a black transfer print of the bridge over the River Cree on the hood. 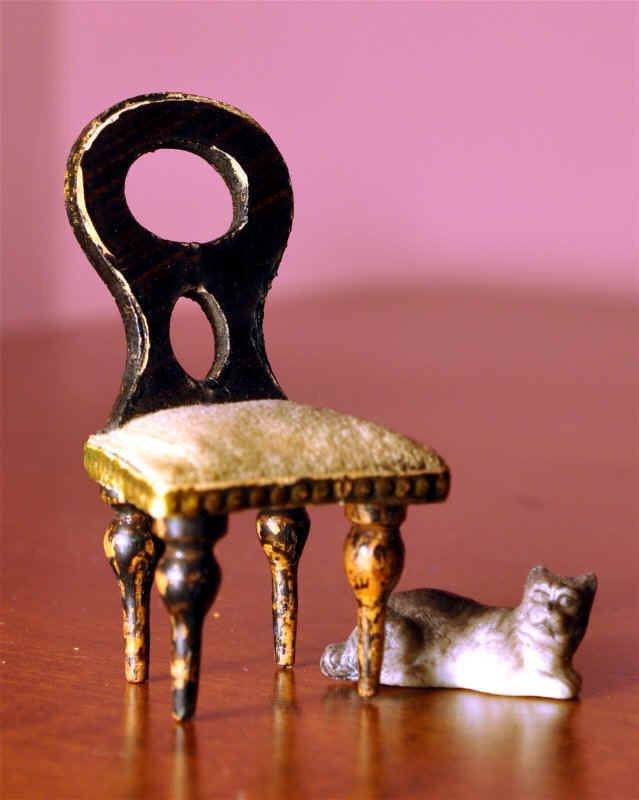 4½ inches long. 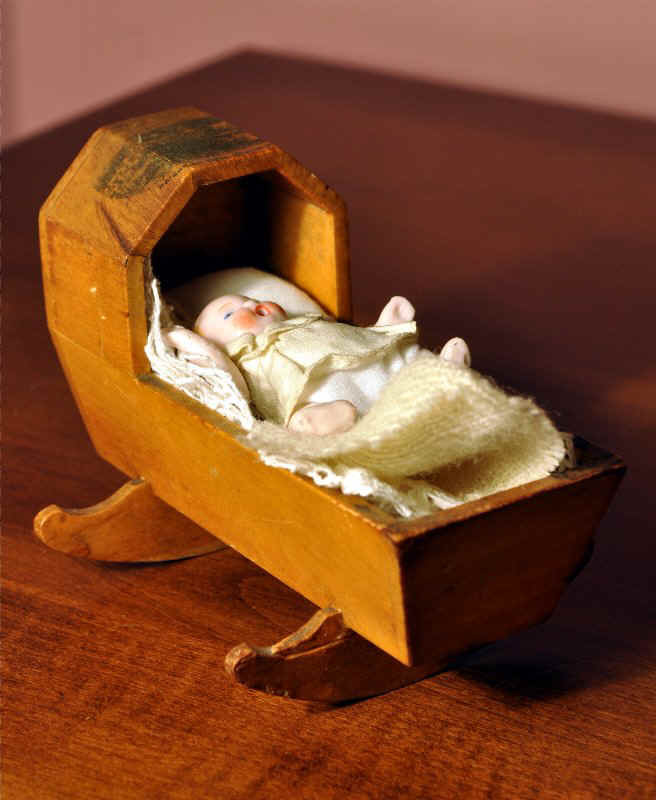 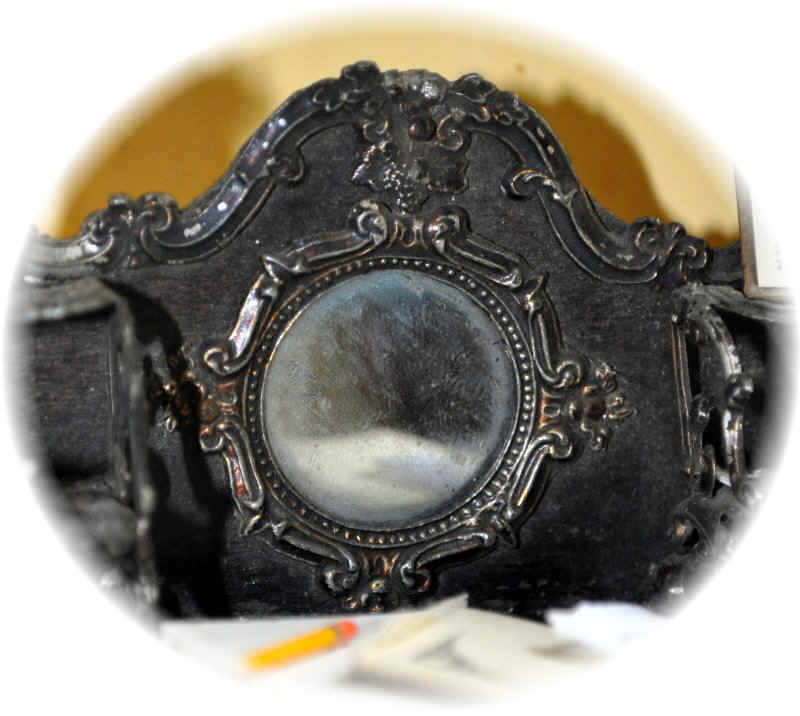 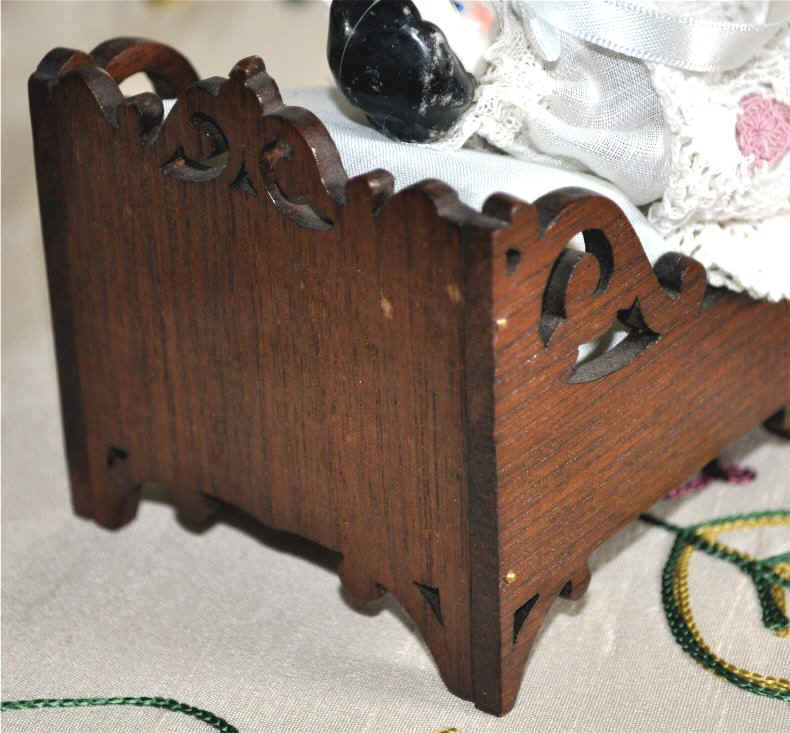 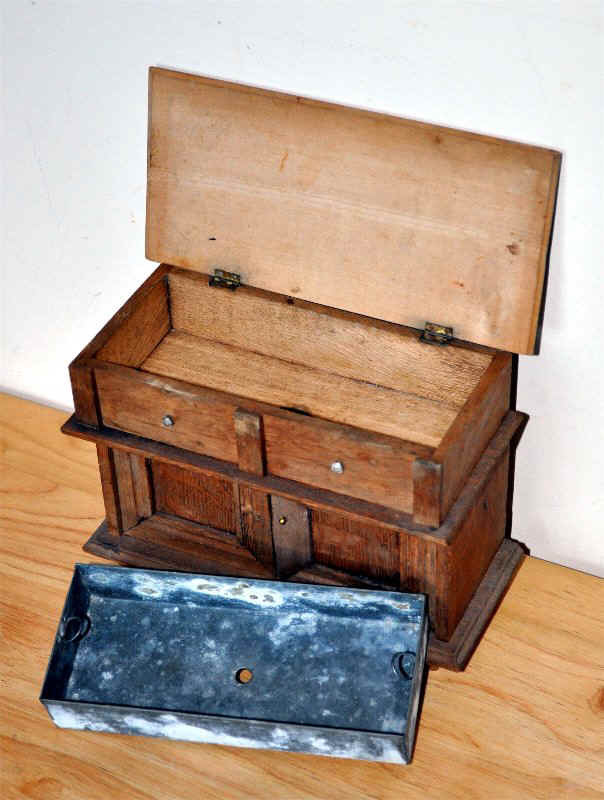 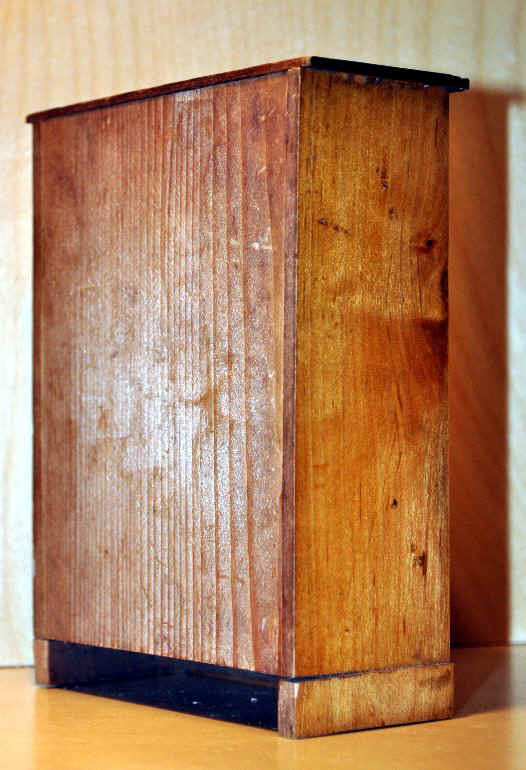 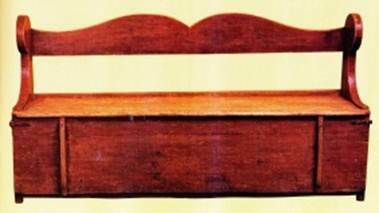 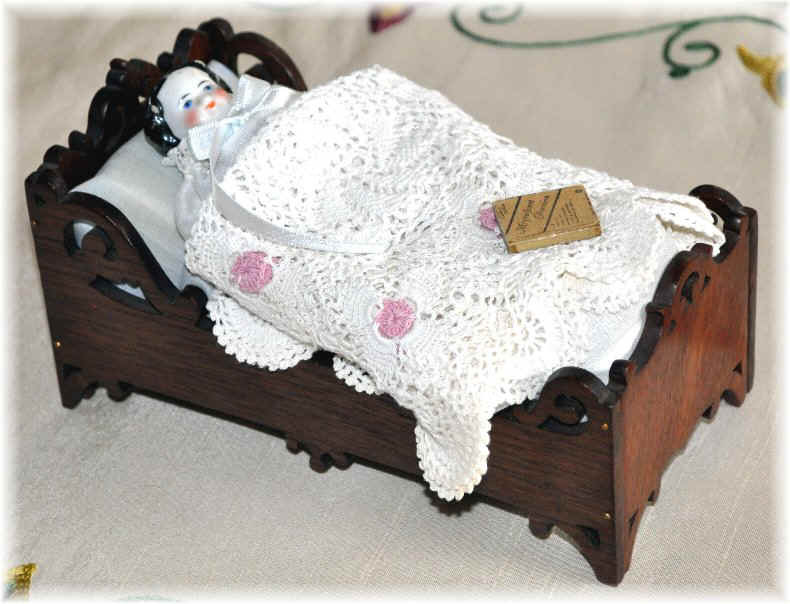 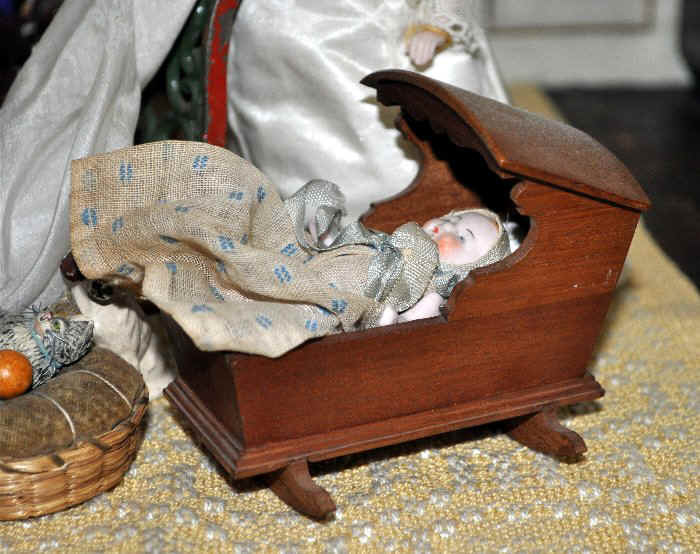 The cradle below is 3½ inches long.